Dapedium a mollusc-eating ray-finned fish that lived in Dorset during the early Jurassic. Fish are cold blooded creatures that inhabit all kinds of water bodies from small ponds to the deep sea. They are vertebrates, with a back-bone made of cartilage or bone and a braincase protecting the brain; they swim using fins; and take oxygen from the water by means of gills (although some also have lungs). These features distinguish them from invertebrates such as sea urchins, molluscs and crabs; amphibians and reptiles, which have lungs and limbs rather than gills and fins; and whales and dolphins which are warm blooded mammals with lungs. Since the late Cambrian, fish have evolved into thousands of species and today they form over half of all living vertebrates. A head-shield of a jawless cephalaspid, from the lower Devonian of Wales. Jawless fish, which resemble living lampreys, first appeared in the early Cambrian and later evolved into many types, including Loganellia and Jamoytius. Some (e.g. Cephalaspis) were protected by thick scales or by boney head-shields. None had bones within their bodies (although they had a notochord) and so fossils are rare. One group, the conodonts, were for decades known only from teeth found in Palaeozoic rocks, but very rare fossils of their soft, eel-like body have now been found. Jawless fish ate tiny organisms and food particles from the sea floor and some may have sucked blood. Jawless fish had a number of cartilage arches supporting the gills. Their brain was protected in a braincase and they had a notochord (a primitive cartilaginous backbone). The front gill support of the jawless fish folded over and evolved into a jaw. Later teeth developed along it. In some cases the second gill is reduced to a small hole called a spiracle. The head of Apateodus, a jawed, ray-finned fish which lived in the late Cretaceous Chalk Sea in Surrey, southern England. The development of jaws and teeth resulted in changes in diet — fish no longer had to eat small food particles, but could catch larger prey. Many different types of jawed fish evolved, but they can all be put in two large groups: one with a cartilaginous skeleton (chondrichthyes) and a second with a bony skeleton (osteichthyes): placoderms (the earliest of all jawed fish), acanthodians, ray-finned and lobe-finned fish. Chondrichthyians such as sharks, rat fish, rays and skates (e.g. respectively Hybodus, Ischyodus, Spathobatis and Sclerorhynchus) had cartilaginous skeletons. The use of cartilage rather than bone was once thought to be a primitive feature, but it is now believed to be an evolutionary advance to aid buoyancy. Naso, a teleost that lived during the Palaeogene, has been called 'surgeon fish' after the scalpel-like bone at the base of its tail. 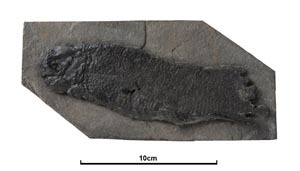 Thrissops, a ray-finned fish from the late Jurassic of Dorset, Southern England. The most primitive jawed fish were the placoderms. They had a bony skeleton, 'armoured' head-shield and plates that covered the front part of their body (e.g. Groenlandaspis and Coccosteus). 'Spiny sharks' (acanthodians) such as Climatius, had a cartilaginous skeleton covered by a thin film of bone. Some were marine and others lived in fresh water. These two groups formed short-lived lineages prior to the evolution of the more successful ray-finned and lobe-finned fish. Dipterus, a lungfish from the Devonian of northern Scotland. Lobe-finned fish, which include coelacanths (like Macropoma) and lungfish (such as Dipterus), first evolved during the late Silurian. They had a bony skeleton and scales like the ray-finned fish, but the paired pectoral and pelvic fins were long muscular lobes, with a bony skeleton and rays, that could be moved independently by muscles. Lungfish are still found living in parts of Brazil, western Africa and eastern Australia and coelacanths live off southern Africa and Indonesia. The evolution of the lobe-finned fish was one of the most important steps in the evolution of vertebrates. Comparison with modern fish suggests that the pair of air sacs of primitive bony fish developed into the swim bladder of many ray-finned fish, but lungs in the lobe-finned fish. The lobed fins of Eusthenopteron evolved into legs and the early amphibians (e.g. Ichthyostega) developed. The bony, ray-finned fish Pholidophorus lived in Dorset, southern England during the early Jurassic. Ray-finned fish get their name from the bony rays that support and stiffen the fins, but which lack muscles (all movement was controlled by muscles in the body). The fins of the most primitive, like Cheirolepis, were rigid, but gradually they evolved, through a stage of slight flexibility, to the mobile fins of today's modern fish. Evolution brought other refinements. The air sacs of primitive types, developed into swim bladders that control buoyancy. The heavy 'armour' was replaced, first by thick, bony scales (e.g. Palaeoniscum) and then by light flexible scales (e.g. Naso). And the skeleton of the tail became symmetrical with lobes of equal length, like in Pholidophorus, giving strong propulsion and improved mobility. Ray-finned fish inhabited both fresh water environments and the sea. Many different types evolved, including the teleosts, the group which forms most of the fish of today. These have thin scales, symmetrical tails and very mobile jaws and fins. One of the earliest teleosts was the herring-like Pholidophorus, which had heavy enamelled scales and only a partially ossified 'backbone'. Salmon-like Enchodus had thin scales, without the enamel covering, and an entirely bony skeleton. Later trout, cod, haddock and perch-like fish appeared. The cartillaginous fin of the Mesozoic shark, Hybodus (a) compared with the bony ray-fin of 'Palaeoniscum' (b), lobe-fin of Eusthenopteron (c) and leg of an early amphibian, Ichthyostega (d) from the late Palaeozoic. Living bony fish, teleosts and lobe-finned fish have, respectively, air sacs, swim bladders and lungs. Their fossil relatives such as Palaeoniscum (a), Thrissops (b) and Dipterus (c) are believed to have been similar. The origin of fish is obscure, but may be found in something like the invertebrate sea squirt or echinoderms. The nearest ancestor to the fish may have been the chordate, Pikaia, which inhabited deep marine waters during the Cambrian. It lacked bones and jaws, but had a notochord on which were attached muscles used for swimming. The evolution of the main groups of fish through geological time. The names of those fish illustrated or mentioned in the text are in italics to show their relative age. A Carcharocles tooth from the Neogene of England. Similar teeth are common in Malta and they are probably the 'snake tongues' said to have been turned to stone by St Paul. Pliny the Elder, a Roman scientist who lived from AD23 to AD79, wrote about 'tongue stones'. He said they resemble a man's tongue and were thought to have fallen from heaven during lunar eclipses. In reality 'tongue stones' are the teeth of fossil sharks like Carcharocles. It was believed that they had medicinal properties preventing rheumatism and, if placed in wine, they formed an antidote against snake venom. This latter notion probably comes from a legend that St Paul was bitten by an adder when he was shipwrecked on the Island of Malta. It was said that he turned the tongues of all the snakes to stone so that they were no longer venomous. Some people still carry a 'tongue stone' as a talisman against bad luck. Lepidotes from the Jurassic/Cretaceous boundary interval, near Swanage, Dorset, the source of toad stones. In his play As You Like It, Shakespeare referred to the belief that 'toad stones' formed inside the head of a toad. If they were removed while the toad still lived, they were believed to have magical powers and so were often put into rings or pendants. When ground into powder 'toad stones' were said to have medicinal properties as an antidote to poison and a treatment for epilepsy. In reality, 'toad stones' were usually the teeth of the fossil fish Lepidotes. Macropoma, a coelacanth that lived in Kent, southern England, during the late Cretaceous. The last of the coelacanths were believed to have become extinct in the late Cretaceous, about 70 million years ago. But in 1938, to the amazement of scientists, a living specimen, called Latimeria, was caught off the Comoro Islands, in the Indian Ocean. More recently these 'living fossils' have also been found off Indonesia. Islanders have known of these fish for many years, and used to use the rough skin as sand paper.